CYPRUS 1989, MOSAICS DEFINITIVE 2C STAMP Opt. Cyprus 1960 Independence Commemorative issue print ERROR in Block of 4 MNH VF. CYPRUS,1989 FIRST CYPRUS VENDING MACHINE ATM FRAMA LABELS,VALUE 0.18 PRINTED ON GUM ! RARE ERROR MNH. Gold coloured moon shaped flaw at the top of the gave AS SHOWN BY THE RED ARROWS IN THE SCAN. 1974 CYPRUS PRODUCTS, FRUIT, FOOD. Agriculture,GRAPES, ORANGES, LEMONS, GRAPEFRUIT, Set of 4v. With "MUFFLON" instead of 'MOUFFLON". CYPRUS 1993. You can be sure that what you buy from us is. Hellenic Territories. Catalog numbers. 100% genuine. The photos are indicative. You will receive a very fine copy, without defects. 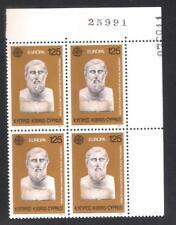 R CYPRUS 4 SETS BLOCK 4 V. 1967 ART RELIGION Mi nr. 303 ERROR! 4 Sets in 1 Block, 4 v. - Art Exhibition Paris, Religion Christianity, 1967. Printing Error. CONDITION: MNH , clean, high (check scans). STRIP OF 4 with LINE ERROR ON 4 DIFFERENT POSITIONS MNH. A single white line across the face of Zenon.The line appears in different positions depending on the position of the stamp within the sheet. CYPRUS 1878-1991,BY POVEY BOOK,NEW SPECIALIZED IN WATERMARKS,ERRORS & VARIETIES. Black pencil between fingers of reader's left hand. (see POVEY PAGE 151). A single white line across the face of Zenon.The line appears in different positions depending on the position of the stamp within the sheet. CYPRUS,1989 FIRST CYPRUS VENDING MACHINE ATM FRAMA LABELS,VALUE 0.18 CODE 002 MISPRINT ERROR MNH. CYPRUS,1989 FIRST CYPRUS VENDING MACHINE ATM FRAMA LABELS,VALUE 0.15 CODE 002 MISPRINT ERROR MNH. CYPRUS, 1971 DEFINITIVE 75M, NINE MOSAIC CUBES MISSING FROM ABOVE ANGEL'S SHOULDER ERROR AS SHOWN BY THE RED ARROW IN THE SCAN MNH. 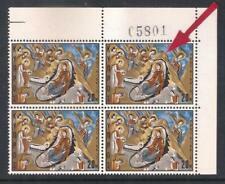 R CYPRUS 4 SETS BLOCK 4 V. 1967 ART RELIGION Mi nr. 303 ERROR! 4 Sets in 1 Block, 4 v. - Art Exhibition Paris, Religion Christianity, 1967. Printing Error.